On March 13th, the Government of Alberta presented Budget 2013, a budget that reflects the fiscal challenges our province faces as a result of international resource market pressures. Even as we take a proactive approach in addressing the challenges brought on by global economic reality, we also continue to take a balanced and responsible approach in making decisions on how best to invest tax dollars in core programs. MORE HERE. 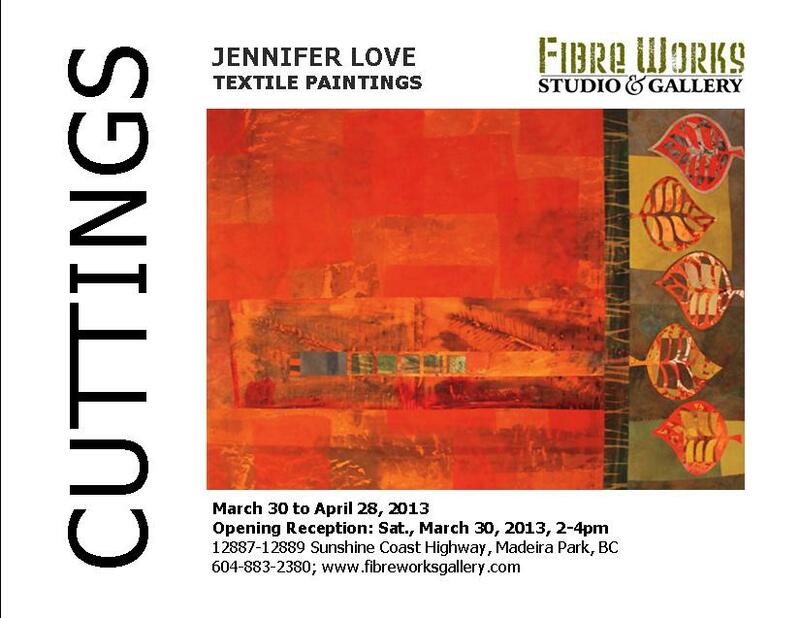 FibreWorks Gallery in Madeira Park, Pender Harbour on the Sunshine Coast, BC. Info from Nicole Dextras about her upcoming ECUAD (Emily Carr) course. Here is the info about my class coming up this summer. 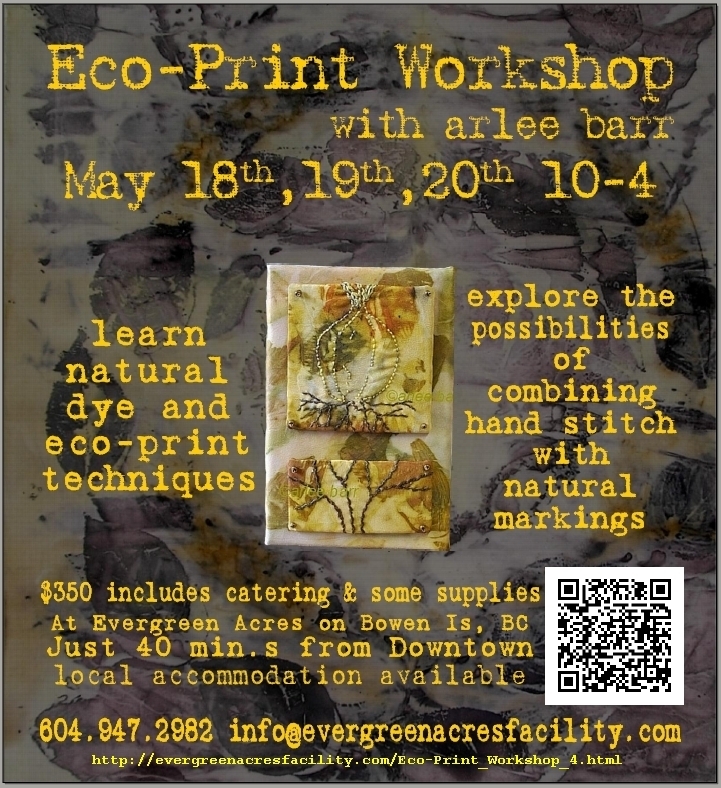 Environmental Installation, June 8, 15, 22. 3 consecutive Saturdays. register with ECU. Cost $245. Working with natural materials, found objects and local environments can be a great source of inspiration. In this course you will learn basic techniques such as plaiting and weaving along with ecological techniques for assembling and fastening organic materials. Attention will be given to building a stable armature onto which branches, leaves or recycled materials can be fastened. You will explore the concept of responding to specific sites through projects that float on water, hang in trees or are situated on the soil. Further reading material on the history of environmental art, featuring the artwork of international and local artists, will also be supplied. Dress appropriately for both indoor and outdoor activities. This is a one day introductory rug hooking class where you will learn the necessary techniques to create or improve your own rug hooking project. The classes run for one day from 10:00am to 4:00pm. The cost of the class includes step by step instruction book, the kit called "View from the Leighton"(designed exclusively for this workshop with an image of an Alberta Foothills), hook, pattern on linen, and wool to complete the project. 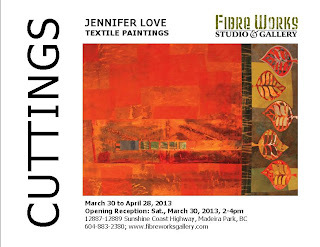 In this workshop, students will be shown new ways to use rug hooking as a creative tool for self expression. Students will learn how to create movement using the techniques of transitional and directional hooking of color. Nothing in nature is straight or even in width; the same rule applies to rug hooking. Treat the wool strips the same way you would use a paint brush. Some areas of color will be wider then others and nothing should be straight. Use narrower strips towards the horizon and the wider strips towards the foreground by trimming the strips as needed. The wool strips included in the kit have been cut with #8 and #6 blades. Students need to bring a 12" to 14" hoop and a pair of fabric scissors. 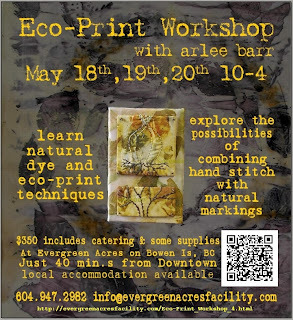 Explore the process of creating natural dyes, and producing prints on our fabrics as well as how to work with your fabric to enhance your creation. Anna Hergert has a couple of thought provoking blog posts about originality, copying and derivation. Part 1 and Part 2. Kristin Rohr "Mapping her world", artist website. The Journal of Modern Craft covers all aspects of craft as it exists within the condition of modernity (conceived as roughly from the mid-19th century to the present day), without geographical or disciplinary boundary.